Our farmhouse bunk beds hold between 400 and 500 pounds per bed! 1 month 3 days ago. Our nightstands are the best way to add a rustic touch to your bedroom or living room! 1 month 6 days ago. A sleek farmhouse dresser for your modern bedroom! 1 month 1 week ago. Our mirrors are versatile and can be use in your rustic bathroom or entryway! 1 month 1 week ago. Our Farmhouse beds have a 6.75 inch clearance underneath! 1 month 2 weeks ago. Back to the basics: our solid unfinished, white cedar log bed. Since it is not finished, you can customize it with your own color or stain once it is in your hands! 1 month 2 weeks ago. Our nightstands are made completely of wood including the drawers! 2 months 1 week ago. After years of having a warehouse to display our furniture we realized the majority of our customers wanted to have their furniture delivered. 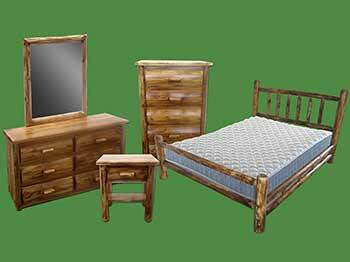 Our furniture is now displayed on our website and we have used the saved overhead cost to keep our prices low and offer free shipping. 2 months 3 weeks ago. The drawer and shelf on our nightstands make them perfect bedside tables! 2 months 3 weeks ago. Need extra space in your kids' rooms or cabins? Check out our bunk beds! 2 months 3 weeks ago. What's the underbed clearance for the platform bed? 6.75 inches! 2 months 3 weeks ago. We have the storage solution handled for your new cabin! 2 months 4 weeks ago. A classic rustic look with our platform bed. 3 months 1 day ago. Happy New Year! 3 months 2 weeks ago. Our log headboards attach to any standard frame. 3 months 2 weeks ago. Put all your new clothes from Christmas in your log furniture dresser! 3 months 3 weeks ago. Merry Christmas from us here at Midwest Log Furniture and Farmhouse! 3 months 3 weeks ago. Our Farmhouse bunk beds include slat rolls, so all you need is a mattress! 3 months 3 weeks ago. 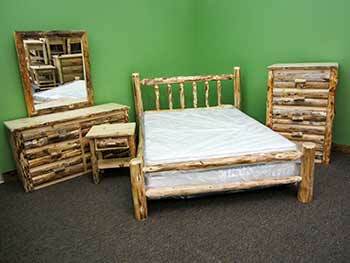 Our log beds come with three support pieces to be used with a box spring and mattress! 3 months 3 weeks ago. 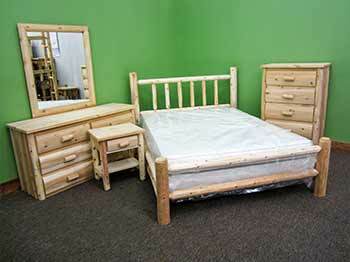 We offer multi-size bunk beds including twin over full, twin over queen, and full over queen. 3 months 4 weeks ago. Take the deal, and get a 6-drawer dresser AND mirror combo! 4 months 1 day ago. Now for a closer look at our Farmhouse drawer, also completely made of wood! 4 months 3 days ago. Here is a closer look at our log furniture drawers, completely made of wood. 4 months 5 days ago. With our unfinished collections, you can stain the wood any color that fits your home. 4 months 1 week ago. Our coffee tables look great in any living room! 4 months 1 week ago.